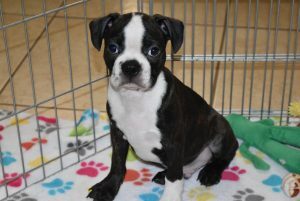 The Boston Terrier is a breed of dog originating in the United States of America. This “American Gentleman” was accepted in 1893 by the American Kennel Club as a non-sporting breed. Color and markings are important when distinguishing this breed to the AKC standard. They should be either black, brindle or seal with white markings. Bostons are small and compact with a short tail and erect ears. The AKC says they are highly intelligent and very easily trained. They are friendly and can be stubborn at times. The average life span of a Boston is around 11 to 13 years, though some can live well into their teens. The Boston Terrier is a compactly built, well-proportioned dog. It has a square-looking head with erect ears and a slightly arched neck. The muzzle is short and generally wrinkle-free, with an even or a slightly undershot bite. The chest is broad and the tail is short. According to international breed standards, the dog should weigh no more than Boston 25 pounds (11 kg). Terriers usually stand up to 15-17 inches at the withers. The American Kennel Club ranked the Boston Terrier as the 21st most popular breed in 2016.